Qwikstixä adds new innovative product to family of drum accessories - Two+One, a new innovative variation of their highly successful 2+2 Stix Holder is now available for sale. Marcat Machining Co. LLC, the “QWIK STIX” solution for drum accessories, is proud to introduce its latest innovations to the Qwikstixä line of musical accessories. Qwikstixä products provide for easy access drum, and other musical accessories, for fast recovery or easy reach. This new product is no different, providing the same capabilities from a new variation. The companies new Two+One Stix holders provide two holders for individual sticks, as well as one holder for multiple sticks, all combined in a single product. This new product is being offered at a low list price of $65.00. The Two+One is CNC machined from aluminum in Nashua NH, and comes in two colors, Black Powder Coat or a Stone Washed Aluminum finish. Clamping options range from a cymbol, rack mount (up to 1 ½ inch diameter), or a floor Tom mount (1/2 inch diameter). Qwikstixä products are designed & developed to work with most major brands of drums and percussion, as well as rack, music, and Microphone stands, and provides the artist a wealth of choices in convenience accessories. 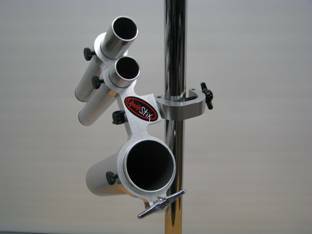 Each combination is designed for quick mounting to any stand or rack bar in seconds. Everything can now be mounted within reach without losing the beat.